José Martí, Cuban hero and independence leader, advocated for education as a civil right and a necessary means for equalizing Cubans’ lives. Early revolutionary leaders drew heavily on Martí’s philosophy and installed education as a vehicle for realizing a more egalitarian society and a central part of national policy. One of the first actions of the revolutionary government, in June 1961, was to pass legislation that created a free, nationalized school system for all. Shortly after, intensive and focused reforms commenced in an effort to ensure that all new schools were equipped to provide all children with a quality education. Before 1959, enrollment rates were much lower than those recorded throughout the post-Revolutionary era. According to the ONEI, in 1958-59, there were approximately 26,662 graduates of primary and secondary education combined; by 2016, this number had risen to 347,064. The inclusion of adult and special-needs students in the educational system further increased graduation rates and educational access. Today, despite material challenges, Cuba continues to invest the third-largest portion of its national budget, 14.24%, in education. The government provides tuition-free preschool through university education to all those who are eligible. The Cuban Literacy Campaign of 1961 is perhaps the most famous example of the Cuban Revolution’s emphasis on education for equality, and it also demonstrates the participatory and popular nature of the Revolution’s most successful efforts. The goal of the campaign was to eliminate illiteracy in Cuba by enabling all citizens to reach at least a first-grade level of reading and writing ability. Volunteer teachers, many of them young girls and women, commuted to the homes of illiterate people to give daily reading and writing lessons. In many cases, these volunteers moved to the countryside for a year to work directly with rural families who previously had little or no access to schooling. The campaign was unprecedented in its efficacy. According to statistics cited by Abel Prieto, director of the campaign in the Pinar del Río province, approximately 707,212 people became literate at the target level over the course of the campaign, reducing illiteracy from 23 to 3.9 percent in only one year. On December 22, 1961, Fidel Castro declared Cuba free of illiteracy. In order to sustain this achievement and ensure that no future Cubans would reach adulthood without the ability to read or write, the government oversaw the construction of thousands of new classrooms. It also coordinated implementation of círculos infantiles, specialized preschool programs that improved early-childhood education, and also contributed to gender equity by giving mothers more freedom to join the workforce. Improvement and implementation of programs for special education was another Martí-inspired reform of the early revolutionary period. The Revolutionary government and its popular participation trained teachers and established both schools and administrative centers, such as the Centro de Diagnóstico y Orientación (Center for Diagnosis and Orientation), for the education of children with mental and/or physical disabilities. The Cuban school system has weathered considerable external stresses, and often struggles due to limited materials. Nonetheless, it has remained a top governmental priority, and even in the extreme financial crisis of the Special Period (the collapse of the Soviet Union), not a single Cuban school was closed, and budgetary allocations for educational development continued to grow. Since 1976, the Ministries of Education and Superior Education have overseen the Cuban school system, which is organized into four departments: preschool; general (primary, basic secondary, advanced secondary, and higher); special; and technical and professional education. All schooling remains free and is mandatory through the ninth grade. University systems remain active in each province, and, like the rest of the educational system, they are free. [vi] Upon graduation, students are expected to “pay back” the society that provided them with their education by spending 3 years in a social service job posting that pays a lower-than-average salary; if they fail to complete this requirement, their diploma is invalidated. In efforts to make education participatory and far-reaching, the government has also implemented a variety of informal educational programs. For instance, the Educa a Tu Hijo program, first implemented in 1992, helps families and communities to provide home-school-like, early education to young children ages 0 through 5. Originally founded to serve families in remote rural areas, the program is now active throughout the country and reaches approximately 463,000 students. Program monitors and evaluators report that since the program was first implemented, the overall percentage of second-grade students who fail to advance to third-grade after one year has dropped from 7.5 to 1.5%,[ix] and that the program is making greater strides in involving community members and parents – including fathers – in the educational process. Another example of informal education is found in programs for adults. For instance, Educación Obrera y Campesina (Education for Workers and Farmers) encompasses all non-higher levels of education and offers course opportunities to enter higher education. In 2000, the “Education for All” television program was introduced, offering televised courses in English, Spanish, and other topics. At all levels of schooling, including specialized institutions, students have opportunities to learn not only in the technical fields, but also in arts, music, creativity, and language. Cuba’s educational system is continuously reformed and refined through measures such as joint investigative ventures between government institutions. 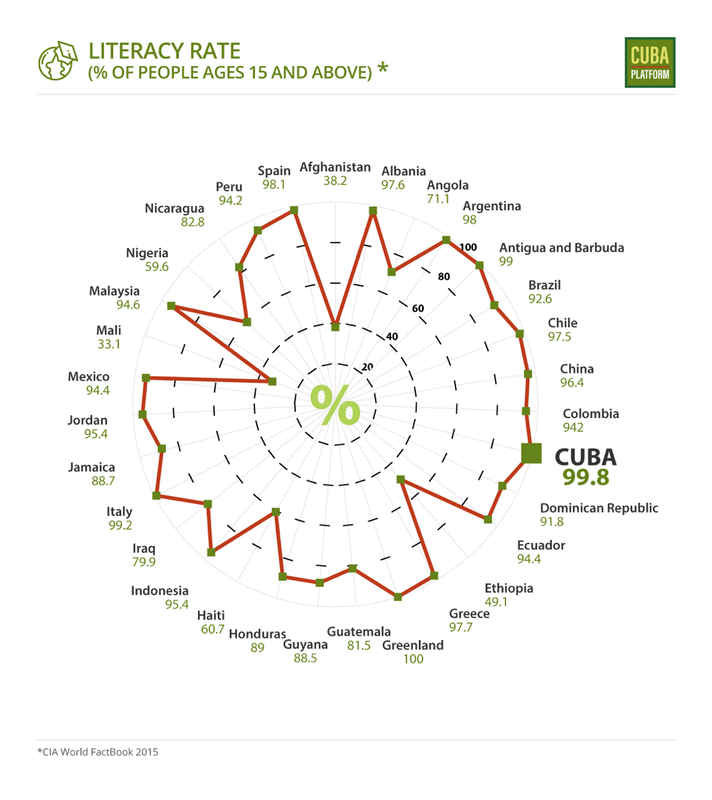 Over the years, the outcomes have proven impressive: for instance, Cuba was the only Latin American/Caribbean country to meet all of UNESCO’s Education for All 2000-2015 educational goals—which included measures for overall educational quality, adult literacy rates, and quality of preschool and early childhood education. Another indicator of success is gender parity, and here, too, Cuba shines: as of 2015, Cuba’s gender parity in education index is reported by its National Office of Statistics and Information (ONEI) to be 1.00 for primary school and 1.06 for secondary school—meaning that in primary school there is a one-to-one ratio of female and male students, and in secondary school there are, on average, 1.06 girls for every boy. In 2016-17, 64.89% of university graduates were women. Cuban preschool programs have also proven highly effective: according to the same UNESCO 2015 report, 99.5% of children ages 0-6 participated in some form of preschool education, and 97% of Cuban children entering primary school did so with the requisite knowledge and skills. Additionally, the ONEI reports that in academic year 2016-17, Cuba’s student-to-teacher ratio, an important indicator for educational quality, for primary school was 9.5:1, and for secondary school 9:1. Adults, too, benefit in this system. In 2016-2017, 70.05% of all workers had earned education beyond a basic secondary degree: 23.76% earned the equivalent of a bachelor’s degree or higher, and the other 46.29% completed technical or professional degrees. Only 5.32% stopped after a primary school education or less. 38.91% of the higher education degrees granted in 2016-17 were medical degrees—a statistic that is hardly surprising, given that Cuba has more doctors per capita than any other country in the world; 70.83% of those medical degrees were earned by women. Additionally, women earned 31.77% of the professional and technical degrees granted in 2016-17. Education is Cuba’s second-highest-employing field; 11% of the workforce are teachers. In 2016, all teachers at the front of Cuban classrooms were certified, and the vast majority university-educated: 75.7% of primary school teachers, 95.0% of pre-university teachers, 96.3% of adult educators, and 97.0% of pedagogical teachers held a university degree. Today, Cuba’s school system stands strong as a global model of commitment to accessible education. Nonetheless, teachers and policymakers face ongoing challenges in how to continue to provide high levels of education in spite of limited access to material resources, including books and computers. The economic challenges of the dual currency system and the changing relationship to the market that affect other sectors of Cuban society also confront the education system. Young people weigh conflicting incentives: on one hand, students can gain social status and pride from earning a university degree; on the other, positions that serve the tourist sector and do not necessarily require advanced education often offer greater economic opportunities. This last concern is evidenced by the fact that far fewer students are electing to pursue a university degree: in 2016-17, Cuba graduated 23,478 students from institutes of superior education, compared to 89,560 degrees granted in 2012-13. An ongoing challenge for the Cuban educational system will be to adapt and remain relevant in the rapidly shifting contemporary Cuban economy.